Sutter Creek Inn 75 Main St., (209) 267-5606. 17 rooms; $-$$. Unsuitable for children. Some TVs & wood-burning fireplaces. Afternoon snack; full breakfast. No pets. Opened as an inn in 1966, this 1859 Greek Revival structure was one of the first B&Bs west of the Mississippi and has staked its claim as the first in California. Rooms are available in the house as well as in six vintage out buildings. As guests arrive each day, homemade lemonade and cookies are served in the garden, and a full sit-down breakfast is served family-style at long tables in the dining room and kitchen. Each room has its own charm--one has a closet filled with books, another a clawfoot tub. 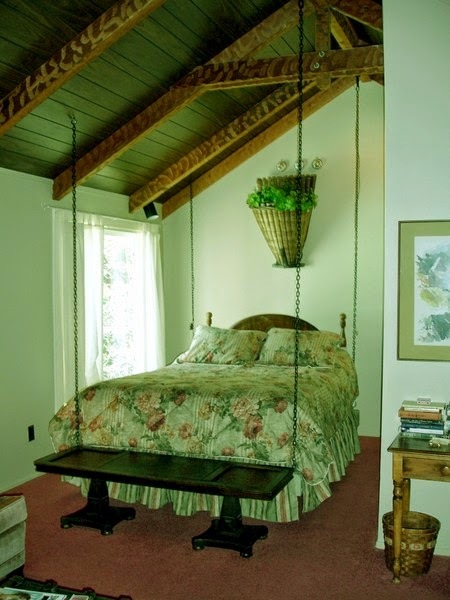 For those who have been longing to spend the night swinging in a bed suspended from the ceiling by chains, this inn fulfills that and other yearnings. Some visitors have even seen a friendly ghost, although it has been more than 25 years since the last sighting. Croquet and hammocks beckon from the garden.